We have been interviewing and it’s been quite exhausting. But, the process reveals more about the colleagues with whom I interact in regards to the search than it does about the candidates. My school is a large and reputable public school and the department ranks about 15th in the discipline. We are no MIT or Stanford, but we are nothing to sneeze at, so I think it makes sense to look for a candidate who actually wants to come here, as opposed to someone who is settling for us. No one knows what tomorrow brings, but I want a candidate who, at the time of signing the contract with us, is genuinely excited about joining the department and enthusiastic about all the years of hard work and collaborations ahead. I don’t want a candidate who is taking this offer because we were the safety school and they didn’t get any offers from any of the several schools where they also interviewed, all located in a specific, widely desirable part of the country far from here. This candidate will likely be out of here before you can say “Rumpelstiltskin” because they never actually wanted to be here anyway. One straw-man counter-argument that was raised is why would you want someone who can’t leave? You want someone who is very good and can leave whenever they want. I don’t want someone who can’t leave. I want someone who can but doesn’t want to leave, at least not before the ink dries on the contract. Yes, I want us to hire someone who is very good and can leave whenever they want, and who has multiple offers, but who actually chooses to be here. I don’t want us to hire someone whom no one else wants; however, I also don’t want someone (no matter how good they seem) who feels that we are beneath their level and who will be looking for the first chance to upgrade. Signing that tenure-track contract is like getting married — you better be enthusiastic about it on your wedding day, otherwise what’s the point? Sure, people “get divorced” from their institutions and move on, but if you don’t actually want to be doing it from the get-go, better not do it at all. Start-ups cost money, searches require energy and time. I know that the loss of each faculty member due to moving or retirement disrupts the department. I don’t like the attitude that we should be grateful to get the “best possible person” if even for a few years. That argument is based on a fallacy that there is such a thing as “The One Best Possible Person”; there are plenty of very good and excellent people who would do great if given the chance. I don’t want someone who will be entirely focused on getting out of here from day 1, I cannot imagine such a person would be a very good colleague or collaborator or contributor to the department. Another interesting issue came up. We have a candidate who is fairly polished, but the past work is not particularly original. However, the candidate does give off the same vibe as one of our best-funded people, so I am confident the candidate will be be successful in the game of schmoozing with program managers. Another candidate is less polished but much more creative and intellectually unique. Some people have raised concerns that the latter candidate might not be successful in talking to grant managers. Look, I am not deluded, I fully understand that you cannot do science without money. But I really don’t understand when the ability to sell, and sell hard, became the most important criterion in recruitment. I would like to think that a person who has interesting and varied ideas and is not a douche could be trained to write grants, alone and with collaborators. I don’t know that you can actually train someone to become original or creative. Are we supposed to do the best science, and raise the money to support it, or are we supposed to raise the money, regardless of what it’s for? Bias rears its ugly head. People are really, really drawn to the candidates to whom they are very similar. Some colleagues will penalize a candidate for having a presentation style and general demeanor different from their own; we have a subarea that is starting to look like it’s populated by clones or, at the very least, siblings. Chubby candidates seem to fare worse than thin ones; I wish it weren’t true, but it is. No matter how well they present, they are never perceived to be quite as polished as the very thin ones, especially by the very thin and polished members of the faculty. This makes me want to eat a cookie. Have you ever noticed how certain words or certain phenomena seem never to be on your radar, you may even be completely oblivious to them, only to show up repeatedly over a very short time span? I remember a few years back coming across the word sinister, not exactly a word frequently used in daily communication, probably five or six times in a single day from as many different and unrelated sources, only one of which was a Disney cartoon where the adjective qualified a villain. Another example, at a much more serious end of the spectrum, is a particular fetal malformation of which I had previously never heard, only to find out that two women whom I knew ended up losing their babies because of it within a few weeks from one another. For some reason, I have heard of three cases of tenure denial over the past couple of weeks. My department is low-drama in that regard, people get plenty of feedback and generally know if they are doing well or not, so surprises are rare. My own tenure case, while anxiety-inducing, was objectively a slam-dunk and was approved unanimously at every level. There were no issues with tenure of the several colleagues who are junior to me, so I sometimes forget that getting denied is a very real possibility. When things look really bad, you can usually see the signs well before tenure and ideally the precarious situation is communicated to the junior faculty member early enough that they can decide whether to do something about their performance or choose a different career path. We have had a few people who left after their 3rd year review because it was clear that there was little that could be done to change the unfavorable disposition of the department. In two of those cases, the candidates were not listening to advice as to what they should do and decided they knew better. When during your 3rd year review it becomes clear that not only have you received no grants (that can happen, everyone is aware of the funds getting scarce), but the reason is that you were in fact not applying at all because you decided it was not important and you were to focus on research as that’s what you wanted to do (I am not making this up) or because you waited for the world’s largest amount of ironclad preliminary data to even begin writing, that’s a really really big problem. That’s how you don’t get your contract renewal after the 3rd-year review. All three cases of tenure denial that I came across recently (R1 schools, different physical science fields) were borderline. In each case the decision could have justifiably gone the other way, but it is not clear that the departments had made a mistake, I can see why they wanted to deny tenure. All three candidates had independent funding and published, but less than optimally; one had issues with equipment, which is very unfortunate, and a corresponding publication gap late on the tenure track. Another had basically very, very few publications, and while the field is such that the publication rate is not high and the candidate ultimately published some very high-impact work, it was simply too little and too late for when the tenure dossier was submitted and I presume that, as far as the tenure-case letter writers were concerned, the record was really weak. Tenure track is short. You cannot embark on a single lofty goal during this period. If you really want to do this far-reaching, high-risk work, you absolutely have to balance it out with shorter-term, sure-payoff projects. The papers that will count have to be published by the end of year 5 on the tenure track, and ideally earlier, so that there’s enough time for people to come across your work. I have seen more than one case where the all-eggs-in-one-basket ended up royally backfiring, even though the seminal finding was eventually published somewhere prestigious — it was just too late. In this sense, tenure track is about strategizing, career engineering if you will, as much as it is about ideas and technical execution. You have to learn the job fast enough and show others that you know how to do it, that you can raise money, teach, advise students, publish papers and give talks, and make a name for yourself — on time. Tenure track is usually not the time to devote all your energy to a project you have always wanted to do; sure, you can do it, but you also have to do something else, otherwise leave it for after tenure. Many people do their best work post-tenure anyway; the key is to do what you need to do to actually get tenure first. You Got Tenure… Now What? Tenure is a major landmark in the life of an academic scientist. While its original purpose was to protect academic freedom and enable professors to teach what they felt appropriate, without fear of retribution, this is not a major concern for most academic scientists and engineers. For STEM folks, tenure means job security and is really a perk that compensates for the comparatively lower salaries than in industry. It also enables us to plan longer-term projects, have flexibility in terms of how we allocate our time and resources, and pursue riskier directions of research. In case it’s not clear, I am a big fan of the concept of tenure. I also believe that the people you really want to tenure are those with a real fire in the belly, those who will keep going even after tenure and for whom the tenure requirement was never a particularly high, unattainable bar to begin with. But it’s easy to be all blasé about tenure from the comfortable position of having it. In hindsight, I was a total mess the year before tenure. At the time I didn’t realize how unpleasant I had been to my colleagues. I don’t know why I was so nervous really, there were never really any hints from anyone that I might not get it: I had papers, two young investigator awards and other grants, had graduated a PhD student, given talks, had great teaching evaluations. Nobody ever said anything even remotely doubtful about my case and I really had smooth sailing throughout, yet that year was extremely stressful for me. I have no idea how I would have felt if I had had something really problematic on my record or if I had faced evaluation by capricious administrators, as some people do. Getting tenure is not really a single event in time, it’s a protracted process and perhaps that’s why the whole ordeal seems entirely underwhelming. At some point, a dossier gets assembled by you or someone in your department and someone sends out requests for external letters of evaluation. The letters take a couple of months to come back and then the department votes for your promotion. For me, this step was easy as the department was unanimous in their support. The next step is the critical one, at the university committee. There are a few rubber stamps thereafter, but the university-level committee is the one that makes or breaks your case. It turned out that step went smoothly, as well. We started my tenure process in May of my 5th academic year (note that you really only have the papers written up and submitted in the first 4-4.5 years on the TT count towards tenure; several people did get into moderately-to-really-deep doodoo for waiting way too long to get papers out). External letters were collected over the summer, department voted in September or early October, and I had the positive university-level decision in early December of my 6th academic year. However, I didn’t get tenure for real until the Regents met sometime in the following summer, and then I didn’t get a raise or the new title until the new academic year. So it was about 9 months between clearing the hoop and actually becoming an associate professor. During that time people would congratulate me at random times or ask about my case and I’d have to explain that it’s all good, but technically I am not tenured yet, so congrats are in order but maybe only unofficially because who knows. The protracted lame duck assistant professordom certainly didn’t fuel the festive mood. At some point in the middle of the summer I did get the official tenure and promotion paperwork, and that’s when I guess we were supposed to break out the champagne but it felt silly by then. We sort of but not really celebrated, maybe even a couple of times. I am pretty sure I bought lunch or dinner for my students at some point. By the time the title and the raise came, there were no festivities left in me. Tenure is supposed to be a turning point, where you stop and ask yourself what you want to do with the rest of your scientific life. To me, it took several years after tenure to relax; actually, I am going to say that I only relaxed once I got promoted to full prof. By relaxing I mean I finally realized that there were things that were making me unhappy about my job, I admitted to myself that being unhappy about them is spoiling multiple aspects of my life, and that I needed to do something because what’s the point of having a secure job people would kill for if you don’t enjoy it. Some of the decluttering involved wrapping up several collaborations — they were not bad, just not worth quite as much time and energy. I finally said goodbye to a large center with which I had been affiliated for a long time; this center was a great “safety net,” a sure funding for one student if all else went to hell, but it really was very little money and the time and paperwork commitment were just staggering. So I decided it was time to cut the cord and it was one of the best, most liberating things I have ever done. I also realized that I was good at writing proposals on my own and that I greatly enjoyed those projects that were mine, all mine. And that I don’t actually have to collaborate just to collaborate, that we had plenty of expertise in the group to do a whole bunch of things, and that I was producing better and more enjoyable-to-write papers when it was just my students and me. So to me tenure meant, eventually, getting rid of the shackles of unsatisfying collaborations, rediscovering the joy of being the boss of me, and focusing squarely on the projects I found challenging and on building up the expertise and publication record of my own students, as opposed to playing second or third fiddle to someone else. Tenure meant really putting on my big-scientist pants and boldly going where no one has gone before (except for 78.3% of everyone who has ever gotten tenure) — into the rest of my career, with the renewed zeal of a horny rabbit on his 4th espresso. How about this instead… Tenure is like an awesome superpower — it takes a while to learn how to wield it, but it can overall bring a lot of good. Use it responsibly! What has receiving tenure been like for you? 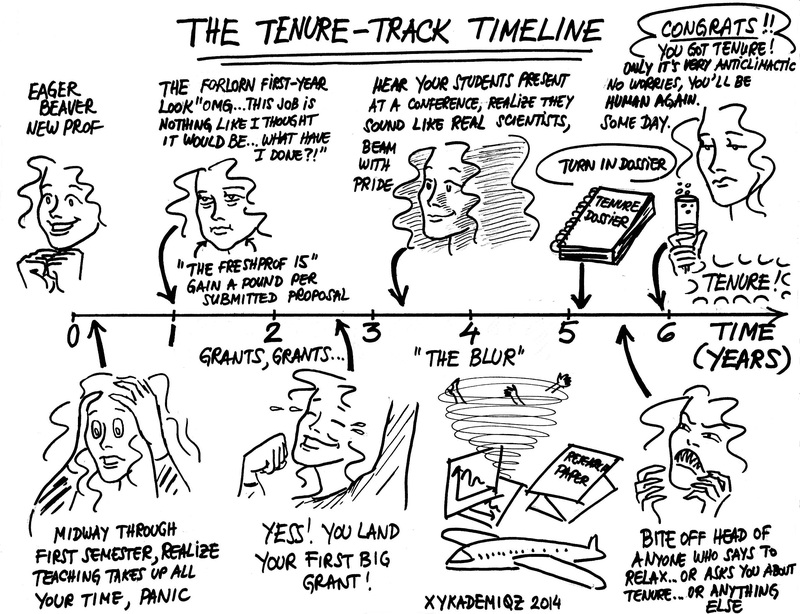 If currently untenured, what aspects of tenure are you looking forward to (or perhaps dreading)?